Here are four receipts for taxi fares which were presented to the committee of Enmore Spiritualist Church for reimbursement. You will see that four receipts were handed in for the 12th December 2008 when Patricia Cleary was only at the church once that day. You will also notice that two of the receipts are completely in Patricia Cleary's handwriting. 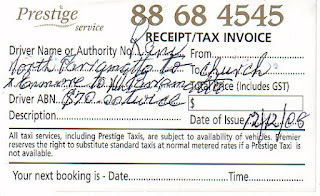 And here's a taxi receipt which was handed in for reimbursement. 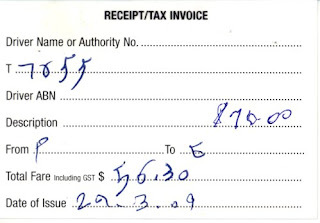 You will notice that $56.30 is there in the taxi driver's handwriting and someone else has written $70.00. 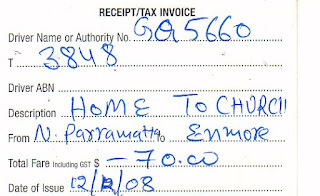 The taxi company informed people that a taxi trip from Enmore to North Parramatta is around $55.00. This would concur with the fare of $56.30. 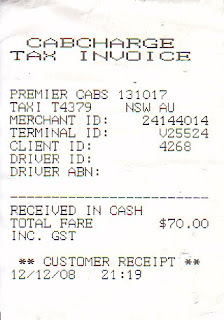 Taxi receipts were handed in for reimbursement almost every week to the amount of $280.00. 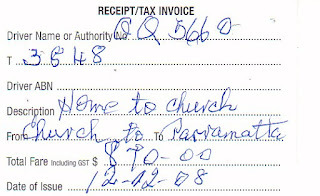 The church was only bringing in approximately $340.00 per week. Anyone can figure out that this is not a viable way to operate.